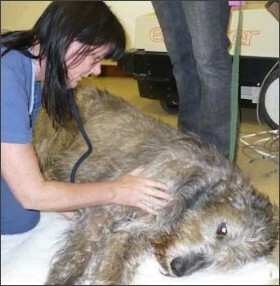 This is an initiative designed to offer all wolfhound owners, be they pet, rescue or show dogs, regular heart screening at very accessible rates and at the same time provide valuable information for ongoing research into heart disease in Irish Wolfhounds by Dr Serena Brownlie. Dr Brownlie has been conducting her research for many years and will continue to do so by attending breed club shows and occasional weekends at breeders' premises. The main areas of concern are AF (atrial fibrillation) and DCM (dilated cardiomyopathy) and how they are inherited. For this we need to test far more dogs, and on a yearly basis, to build a more complete picture. In particular, we need to see older dogs with healthy hearts. 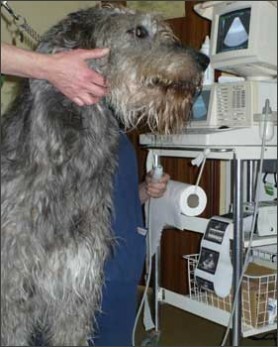 The screening is non-invasive and includes a stethoscope examination, an ECG (which usually requires your dog to lie on the floor), and an ultrasound scan (with the dog standing - there is no need to shave or sedate the dog). All information provided and results are confidential and are forwarded to Dr Brownlie to add to the database. Certificates are provided for owners to give to their own vets and any dogs requiring further investigation/ treatment are referred back to their own vets for onward referral. Payment is subsidised by the Health Group to ensure that everyone pays the same at each session and that it is affordable for all. The cost per dog is currently £50 for the full screening, which is excellent value and we are also grateful to our cardiologists for making this possible too. Regular heart testing is recommended as the check-up is not a one-off exercise - it only confirms the state of the dog's heart at that particular time, but it cannot guarantee that the dog's heart will remain unaffected in the future. The advantage of testing is that full screening can identify heart disease before clinical signs have presented, and with early intervention and modern drugs there is the possibility of normal life expectancy being attained and a good quality of life for your dog for the longest time. 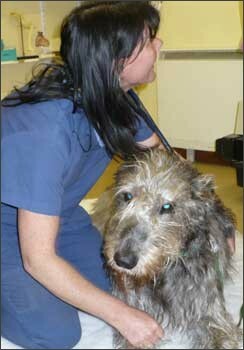 The UK has been split into various regions so local wolfhound owners and breeders have access to testing. Should demand grow, and where cardiologists are available, we will endeavour to provide more sessions. currently open for booking here. IT IS THERE FOR YOU AND YOUR HOUNDS.